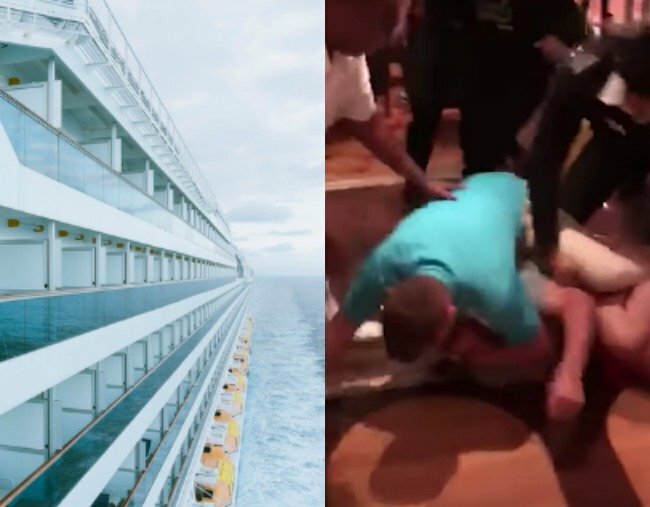 Cruise ship family brawl leaves passengers fearful for safety. Entire Aussie family kicked off cruise ship after getting into brawl. Passengers aboard a cruise ship that booted off a large “violent” family have described three days of mayhem during what was supposed to be an ideal holiday through the South Pacific. The Carnival Legend arrived at its homeport in Melbourne on Saturday, following an unscheduled stop to offload the 23-member family at Eden on the NSW south coast. Days of fighting onboard preceded a major brawl at the ship’s nightclub during the early hours of Friday morning. Passenger Lisa Bolitho said the “big Italian family” spent the past few days attacking “Aussies”. “Very violent, they were full-on attacks,” she told reporters on Saturday. “The captain said ‘What do you want me to do about it – throw them overboard?’. Ms Bolitho questioned management’s handling of the incident. “We were saying ‘We want them either locked up or taken off board’. It never happened and there was another four occasions,” she said. She said security staff ended up “jumping” the family, and had no choice but to do so. Ms Bolitho’s son Jarrah was targeted by the family, with the pair fleeing and locking themselves in their cabin. “I was watching the fight and one guy came up to me and said ‘Do you want to go too bro?” Jarrah said. Other passengers questioned the actions of security, claiming staff confiscated and deleted video footage passengers took on their mobile phones. A NSW Police investigation is now underway into the brawl aboard the ship, which was well into its 10-day cruise. Carnival general manager Jennifer Vandekreek says there were “limited and isolated events with the family in question” in the lead-up to the brawl. Carnival Cruise Line has also launched an internal investigation into the incident.